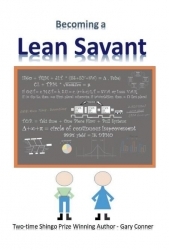 Thirty year consultant and two time Shingo Prize winning author Gary Conner has just release his latest book "Becoming a Lean Savant." Salem, OR, March 23, 2019 --(PR.com)-- While the author does not claim the status of Savant (sa 'vant / noun: scholar, sage, philosopher, learned person), he has served 350 clients and facilitated 1,500 projects across the U.S. and Canada. This text represents an easy to read, practical explanation of the What, Why, When, Where, Who and How Operational Excellence can be adopted and adapted within any business environment. Readers of this text are invited to utilize an 10 gigabyte, cloud-based resource containing hundreds of files, examples, case studies, videos, and photographs demonstrating how hundreds of other organizations have transformed from a "business as usual" to the Lean Approach.